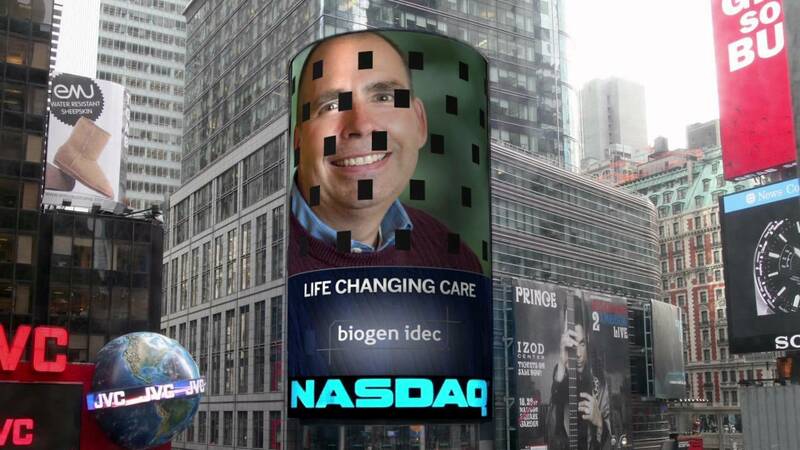 Following a volatile earnings reaction, there’s more reasons than not both off and on the price chart to see the path of least resistance as up at biotech Biogen Inc (NASDAQ:BIIB). But for bullish-minded traders, a well-placed long-call vertical spread in BIIB stock is what seals the deal. Let me explain. It wasn’t a perfect report and it certainly wasn’t the easiest of gains, but BIIB stock did manage to finish up over 2% after all was said and done in Thursday’s session. Some of what was said regarding Biogen’s Q4 results allowed for the company to top sales estimates, raise its full-year outlook above Street views and even seal a deal for a smallish experimental brain disorder drug for up to $217 million. As one analyst noted, “It was a pretty clean quarter” for Biogen. Yet some of what was done on the daily price chart appeared at times to take issue with BIIB stock’s results. Intraday, shares began on a high note opening up by about 3% before quickly tanking into the red, then seesawing their way higher during the remainder of the session. Were profit-takers or shorts behind the aggressive and early selling reacting a bit too sensitively to Biogen’s profit blemish, or maybe disappointment a larger deal wasn’t sealed? Without having speed-dial to those folks shorting or trimming positions out-the-gate, we’ll never know. But given what’s been said and done off and on the price chart, this strategist sees the case for a rally in BIIB stock. Unlike the broader market, BIIB stock has undergone a massive correction of nearly three years in length. At its darkest moment in mid-2016, shares of Biogen were trimmed down by a bit more than 50% from its March 2015 all-time-high. That’s good news technically, as prior extreme bullishness was reset to a more neutral and bearish state and should allow BIIB to move higher with greater ease. Currently and on the heels of BIIB stock’s earnings report, shares are testing the 62% Fibonacci level. 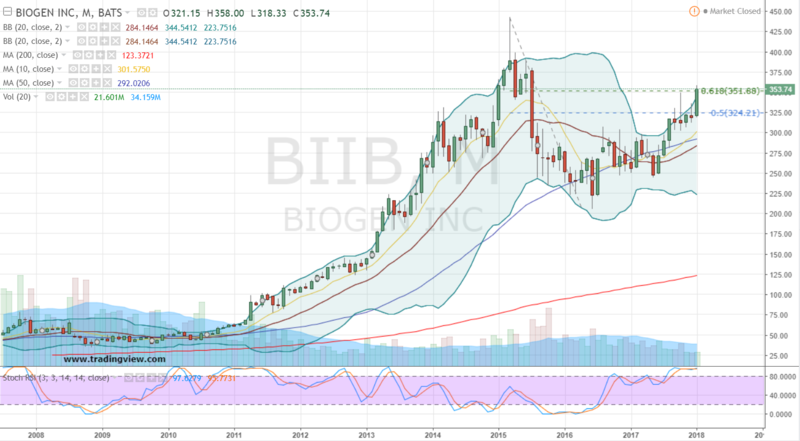 Our view is today’s challenge should lead to a breakout higher within the right side of Biogen’s corrective cup-shaped base and ultimately fresh all-time-highs later this year. One spread of interest in BIIB stock is a slightly out-of-the-money, bullish long call vertical spread. The combination requires only modest capital to open a position, effectively reduces and limits risk and offers an attractive risk-to-reward profile. Reviewing the options board, a favored combination with shares at $353.74 is the March $360/$370 call spread for $3.60. The vertical is the equivalent of just over 1% BIIB stock risk below the purchased $360 call and requires shares to rally 2.7% by expiration in order to break-even. Bottom line, this vertical could result in under-performing a long stock strategy as implied above. However, a 1% insurance policy in a biotech, even one of Biogen’s stature, is nice to have in place. And if BIIB stock does cooperate technically, a potential max payout of $10 for $6.40 profit and return of 178% if shares rally 4.5% is a well-designed way to ride BIIB to even bigger gains. Article printed from InvestorPlace Media, https://investorplace.com/2018/01/biogen-inc-biib-seal-the-deal-in-biib-stock/.